This post is the last (for now!) in our series about how Prince George’s County could improve TheBus, its public bus system. You can read the previous installment here. In April and May, GGWash published a series of posts discussing some of the problems with Prince George's “TheBus” network and suggesting improvements that we hoped to see in the county's new Transit Vision Plan. Now that the initial recommendations have been released, let's compare them to what we proposed. However, rather than improving the overall frequency, the proposal suggests mostly having buses come more frequently during peak periods. It suggests having buses come every 30 minutes on the 13, 14, 15X, 18, 26, 28, and, 30. Reducing midday headways (which is an off-peak time) to 45 minutes is only suggested for four routes: the 16, 18, 21, and 35. In the longer term, peak headways of 20 minutes and off-peak headways of 30 minutes are suggested on the 16, 18, 21, 24, and 32, and a mid-day headway of 30 minutes is suggested for the 20. The longer-term proposal for 30-minute midday headways on the 10 highest-ridership routes would be a major boon to system usability. This would (unlike 45-minute headways) allow clockface scheduling, where buses arrive at the same times each hour. However, the time scale for the “longer-term” recommendations is unclear. Improving peak headways on routes that are overcrowded during commuting hours is important. Overcrowding can slow buses down because it takes extra time for riders to board. However, if TheBus is to serve all riders and not just peak commuters, it is essential that it reduce its midday wait times as well. While the recommended headway reductions are an improvement, they would still leave the 20 — TheBus's fifth-highest-ridership route — with 60-minute headways. All other routes with proposed Saturday service would have headways of 45 minutes or less, but the 15X and 37 would continue to have no midday service. Midday wait times of 50 to 70 minutes would remain on routes 12, 25, and 53. The Transit Vision Plan's recommendations for increased hours of service are more conservative than we had hoped. Weekend service with headways of 45 minutes is only proposed on Saturdays until 9 pm, and routes with evening service would end service at 10 pm on weekdays. However, this would still be a major improvement over the service we have now, and is a reasonable start on the path to eventually having weeklong service lasting until midnight or later on major routes. 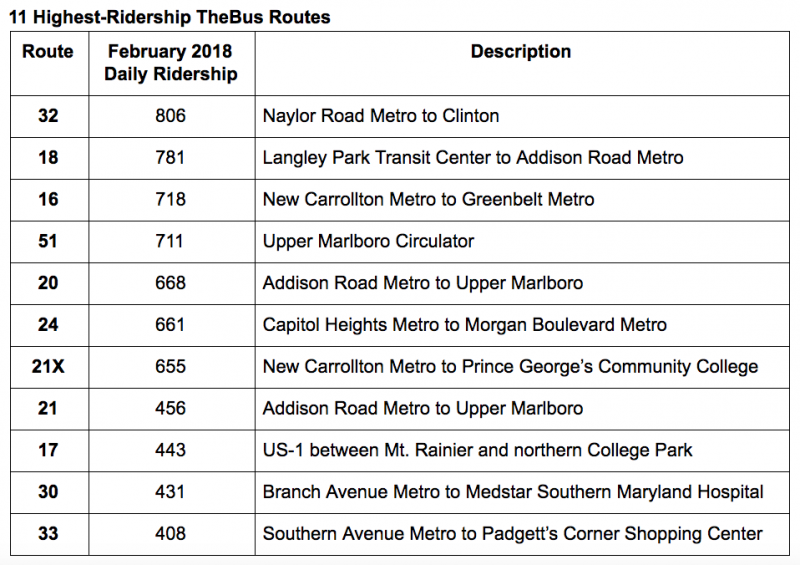 TheBus's eleven highest-ridership routes. Image by the author. The 51, a circulator in Upper Marlboro that mostly serves visitors to and employees of the courthouse and county government offices there, has no recommended service increase. Evening service on that route might potentially be useful for people attending evening meetings and public comment sessions, but Saturday service on it would probably have very low ridership because the courthouse and county offices would be closed. Likewise, the 30, which serves Southern Maryland Hospital, is recommended for Saturday but not evening service. In addition to these routes, the recommendations include evening and Saturday service on routes 11, 33, and 34 and evening but not Saturday service on routes 15X and 28. While the 11, 33, and 34 are also high-ridership routes, it is initially puzzling why the low-ridership 15X and 28 were selected, especially since the 28 is one of the lowest-ridership routes in the system. However, the proposal of evening but not weekend service on the 28 makes somewhat more sense. It connects the Largo Town Center Metro station to some of the county's new offices in Largo. The 15X on the other hand seems like a stranger choice since it's one of only two TheBus routes not to run at midday, and the proposed recommendations don't seem to include changing that. The Transit Vision Plan's suggested changes would affect half of north county routes and the majority of central and south county routes. The proposal includes breaking a number of routes into two, some attempted simplifications of routes, and extensions and detours to serve additional locations. Some, but not all of the routes that we said need changes are among those proposed for major adjustments. No changes are suggested for route 28, but the recommendations do include breaking routes 22 and 23 into two shorter routes, as well as extending the former north to New Carrollton. Other than route 12, the proposed changes to north county routes are fairly minor. Better names are suggested for the two directions of route 13, which is a large, bidirectional loop. Route 17, which supplements Metrobus routes 83 and 86 on US-1 inside the Beltway, is suggested for an extension to the Greenbelt Metro station, though it is not clear how this would work, and whether this would supplement or replace the Metro connection at College Park. The biggest proposed change in north county is to split route 18, which runs near the DC border from the Takoma-Langley Transit Center to Addison Road, into two routes, and possibly to extend one of them to Greenbelt. Dividing the route — probably at the Cheverly Metro — might make sense to increase on-time performance on such a long route, but it's not entirely clear to me how an extension to Greenbelt would work, and it doesn't seem like it would make obvious sense to make Greenbelt service part of the current route. More changes are recommended in central county. In addition to routes 22 and 23, route 21 is recommended to be split in two. Splitting the 21 in half at Largo Town Center would eliminate a one-seat ride from New Carrollton to the county offices and courthouse in Upper Marlboro, but given the route's circuitous nature north of Largo Town Center, a well-timed transfer between the 21X and the southern of the two 21 routes might provide at least as good service. In central county, it suggests extensions to routes 30 and 27 and rerouting 21X and 26. Rerouting of the 21X is notable because, while it would provide service to Woodmore Town Center, it would also somewhat compromise the route's “express” nature, as it would require a detour off of Landover Road. Other than splitting route 35 into two routes and eliminating route 35S — which had an average of 31 daily riders in February and only provides peak service — the proposed changes in south county are relatively minor. Routes 33, 34, 36, and 53 might get extensions. Of these, the potential change to route 53 is the largest. The 53 is currently a short route connecting some residential neighborhoods near the Town of Upper Marlboro to the town center. The proposed extension of the route to the Suitland Metro is likely to significantly increase ridership on the route — which currently gets about 40 daily riders — by turning it into a connection between the Green Line and the county offices and courthouse in Upper Marlboro. This could help significantly improve connectivity from north county to Upper Marlboro, which is currently a major problem with the county's transit network. Call-A-Bus, Prince George's County's paratransit service, is a bit different from other paratransit services such as MetroAccess in that it is available both to people with disabilities and to anyone who needs service to areas not served by fixed-route transit. The fare is also unusually low for a paratransit service: rides are free for seniors and disabilities, and other passengers ride at a fixed rate of $1/ride. The Transit Vision Plan recommendations suggest it as an alternative to fixed-route service in areas not served by TheBus, including the route of the 35S bus, which the plan recommends eliminating. However, it does not address the issue that Call-A-Bus is only available on weekdays from 8:30 am to 3:30 pm. For each of these preliminary recommendations, it's unclear when they would be implemented. The most recently-published version of the proposal promises recommendations by May 7, 2019. In any case, implementing these recommendations would require significantly increasing funding from the County Council. Nonetheless, it's heartening to see these potential changes. Hopefully the final proposal will include changing TheBus's confusing name and fixing its bus stop signs as well.